After a cloudy morning, the low clouds broke up and both the sun and higher cirrus clouds became visible. 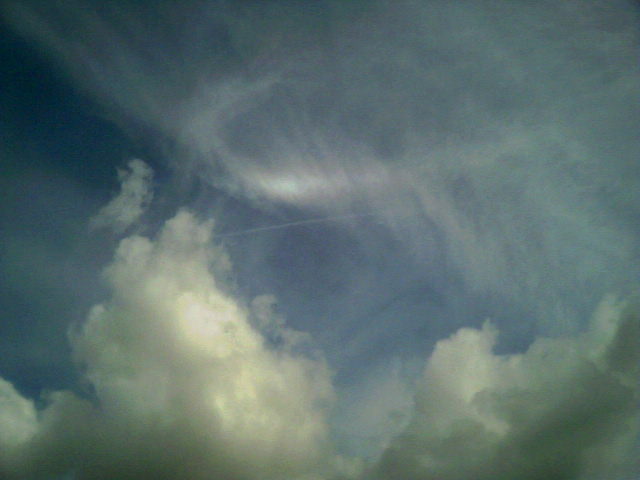 The appearance of the cirrus was an indication for me, to keep a keen eye on the sky. That policy was worth-while, because a short time later, at about 11.35 C.E.S.T., a part of the Parhelic circle appeared, together with a remarkably bright 120 deg. Parhelion, in NNE-ly direction. Both the parhelic circle and the Parhelion presented a clear brownish-reddish fringe colouring. Immediately, I fetched my mobile-phone-with-camera, and made the picture, accompanying this message. Nice to see a description and photograph of this observation here! I witnessed this event about 25 kilometers to the east, from Waddinxveen, The Netherlands. The description by Frank is exactly what I observed, however I saw a part of the parhelic circle and two 120 parhelia. At first I doubted wheather these parhelia were actually Liljequist-parhelia, because the distance between them was rather small. But the red-brown color of the parhelia, together with a 40 degrees sun-height made this not very likely.